There’s a reason many of us put off getting a cell phone until we have to: for the first couple days (or weeks, in some cases), everything takes longer. There’s the upfront investment of time to set preferences the way you like them, authenticate passwords, and learn which buttons do what when. Getting a new device makes you think again, makes you pay attention. It can be tiresome, inconvenient and sometimes frustrating. This same scenario plays out on a large scale across organizations when making a large technology change, and it’s called a productivity dip. 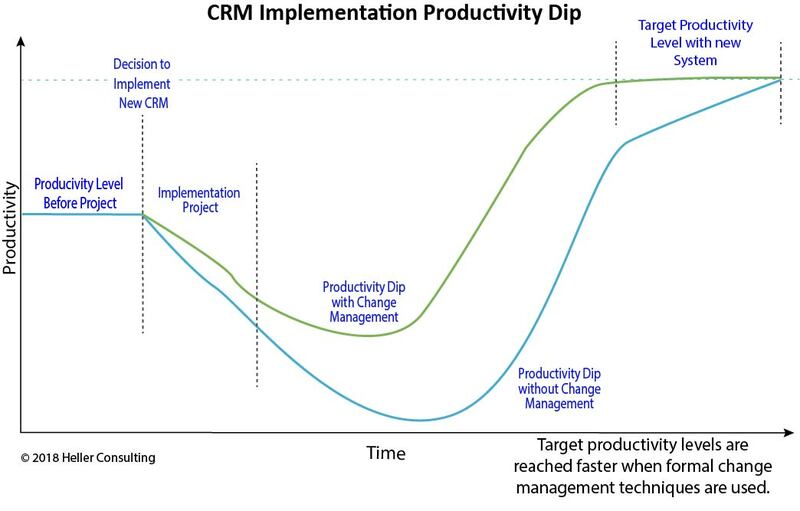 The productivity dip looks like this in action: An organization implements a new CRM system to centralize its data and allow for better management and reporting on its constituents, activities, and performance. Participation in user acceptance testing is decent, though a couple of key people bow out. Many issues are caught and addressed, and staff members try their best to picture the new ways that processes will work. Then the system is launched and the old system is shut down. People log in and look around and can’t remember how to do even the most basic of tasks. They find training documentation and step through the things they need to do, sometimes beckoning the person next to them to help. At the end of day one, they find they accomplished about a third of what they would have on a typical day prior to the launch. It feels shocking. In the weeks and months that follow, many staff members have days like this as they build the muscle memory for working in the new system. The reality is that an organization simply cannot get the same amount of work done while employees are learning how to use a new system for their work. Most organizations don’t plan appropriately for the inevitable productivity dip. Not factoring in the time required to re-learn and re-establish processes means failing to accomplish some of what was planned. Or employees try to cram it all in and produce lower-quality work. If any of these factors are visible to external constituents, these issues can result in missed fundraising or mission delivery goals, and the project immediately seems like a waste. A productivity dip is inevitable but employing formal change management techniques that engage end users throughout your implementation project will help mitigate the effects. Users should know what is expected of them before system launch and that adoption metrics will be captured and reviewed by management. Establish reports on appropriate and meaningful metrics that show which individuals are embracing the new system and which may be struggling to adapt. Continue looking at reports and inform end users that reports are being reviewed. Direct supervisors should include discussion of these metrics in one-on-one and/or team meetings as appropriate. People who are resisting or self-conscious about learning new tools will rarely self-identify for help; most will try to work around the problem. For this reason, it is important for managers to be looking out for them and finding out what types of support they need if they are struggling. To help offset the time spent learning new things, many organizations hire temporary staff. For a variety of legitimate reasons, integrations are often developed after the initial launch of a CRM system. Temporary help with data entry can ensure that other staff members have room to focus on learning and refining new business processes. This one is a tough sell to many nonprofits, but we feel we would be remiss not to mention that another way to deal with the inevitable productivity gap is to temporarily reduce your productivity goals. Most organizations (including ours!) have at least a few things they do year after year because they’ve “always done them” or feel a particular constituency depends on it. However, this is an opportunity to let go of efforts that are growing stale or not yielding the return they once did. You may find that some of these activities never need to return and create space to add fresh initiatives in the future. If you communicate your intentions to constituents and funders ahead of time and convey clearly that you are making a short-term time investment needed to improve your infrastructure for better long-terms results, you will earn respect from your supporters. When people understand that there will be a productivity dip and they are expected to learn and use the new system, they will incorporate the new tools into their work more quickly. The faster each individual adapts, the shorter the productivity dip will be for the organization as a whole.